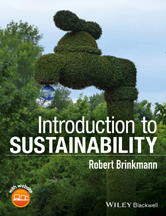 Introduction to Sustainability is the first major textbook to review major themes in the cutting-edge field of sustainability.The text includes material on the development of the field of sustainability; environmental sustainability issues like water, food, and energy; social sustainability themes like environmental justice and transportation; and economic sustainability topics like green businesses and economic development. Why are businesses concerned with sustainability? Can businesses with unsustainable products be sustainable?